I planted three zucchini plants this spring and you wanna know how many squash actually grew? I only had one squash amongst three plants. Major let down! Better luck next year I guess. Growing up, my mom always made two kinds of muffins/loafs; banana and zucchini. These past few days, I’ve been staring at the lone zucchini on my counter dreaming of ways to use it up. Lots of ideas came to mind, but I was feeling particularly nostalgic and wanted something simple and familiar. 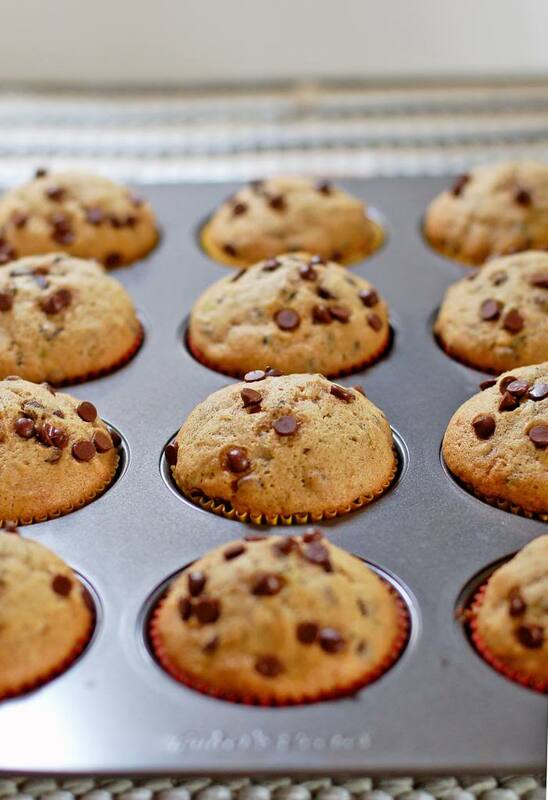 These muffins are one of my all time favorites! I used mini chocolate chips to allow for better distribution and sprinkled some on top of each muffin after I had scooped the batter into the cups. These are sure to please even the pickiest eaters. Beat together the eggs. Add oil, sugar, vanilla, cinnamon and mix until well combined. Stir in zucchini. Sift together, flour, salt, baking soda and baking powder. Add to wet ingredients and mix until just combined. Stir in chocolate chips. For Muffins: Line two muffin tins with paper cups. Fill each cup 3/4 full. Bake at 400 degrees F for 15 minutes. For Loaves: Grease two loaf pans and divide batter evenly. Bake at 350 degrees F for 1 hour.